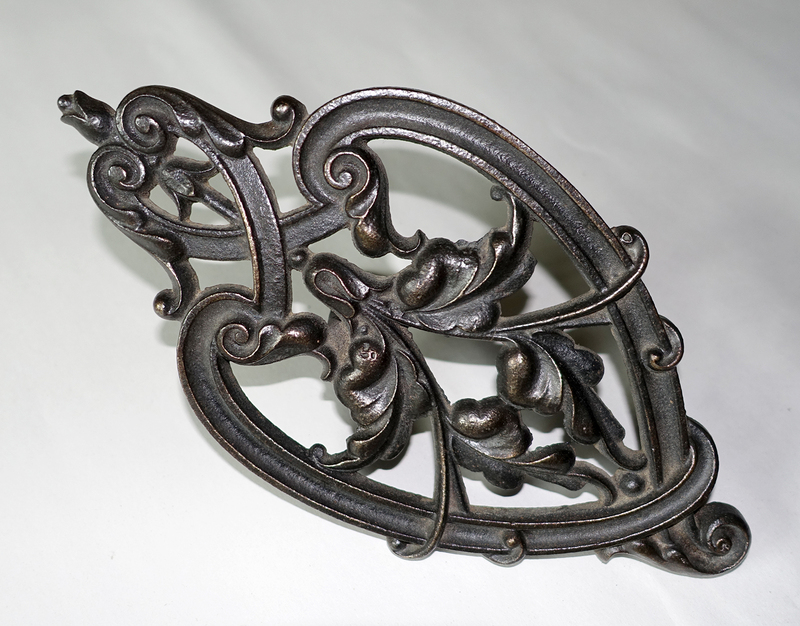 This ornate trivet from Great Britain is one of my favorites because the design is so intricate and beautiful. It would have attached to a parlor stove or fireplace firebar rail by the two cleats at the underneath edge. The third support kept it securely in position at a right angle to keep a coffee or tea pot warm. Details: cast iron, 9 3/4″ x 5″ with two 0.75″ cleats and a permanent firebar. The weight is 1 pound 14 ounces. This trivet is signed No. 111-12 with an Rd diamond. There’s minimal wear to the top surface. Two fine hairline cracks, visible only on the reverse, do not affect its integrity. The permanent firebar support extends out 4″ and prevents wall display but the trivet rests on its side at a 45 degree angle for shelf display. ● If the trivet has an Rd Diamond or an Rd Number it’s a product of the British Isles, comprised of England, Ireland, Scotland, Wales, and the Isle of Man. 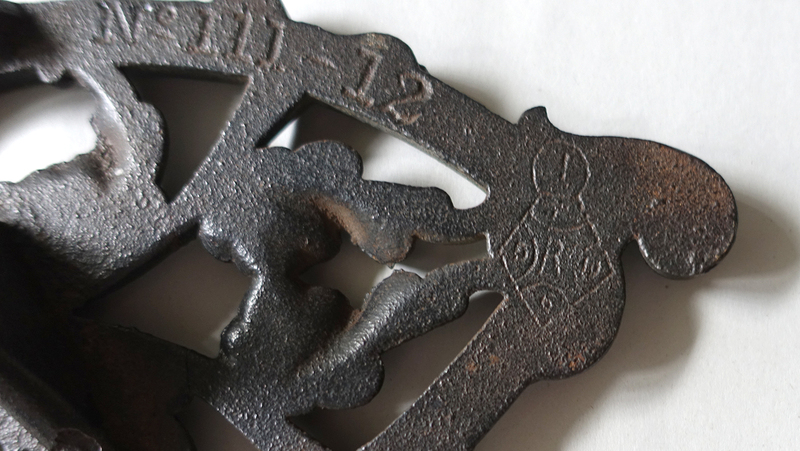 ● A trivet with an Rd Diamond is always older than one with an Rd Number. ● A Diamond is the most accurate dating method, as it specified the actual date of production for a specific trivet bundle. ● 1st series diamond marks were assigned 1842-1867; the patent year is identified by a letter in the upper corner. ● 2nd series marks were assigned 1868-1883; the patent year is identified by a letter in the right corner. ● In 1884 the system changed to a series of numerical marks called an Rd number, which records when a specific piece or design was registered. It doesn’t necessarily indicate the production date of the item, which could continue for years on a popular item. Since there’s an Rd diamond on the reverse, let’s decipher the code together. Compare the diamond above (click to enlarge) to my sketch below. The number 1 in the top circle identifies the patent category as Metal. Quickly we realize this is an older, 1st series Rd diamond since the letter T is in the upper corner! 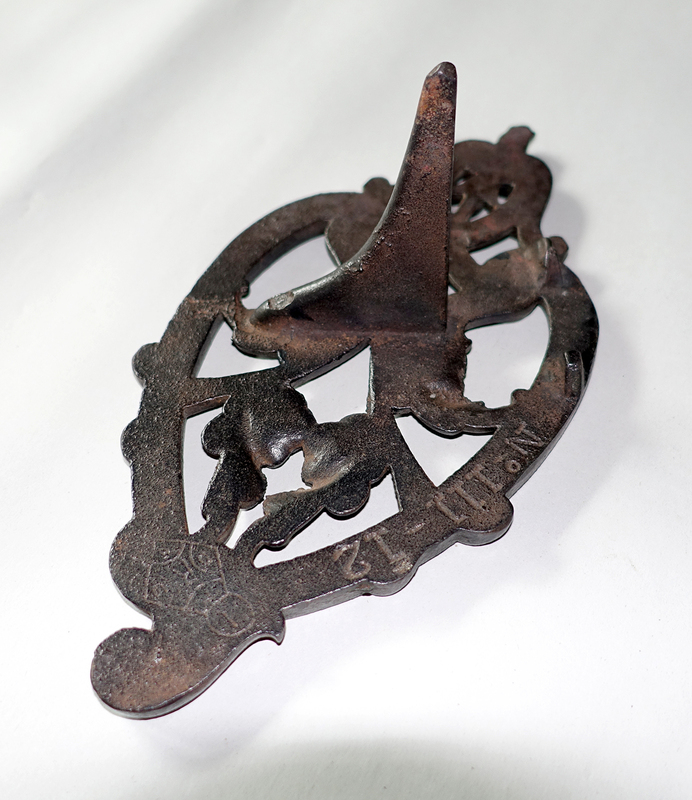 After review of the other markings it can be determined this trivet was cast on September 10, 1867. The bundle number of 5 holds no special significance. For more information on understanding and deciphering British registered design markings, see Diamond marks and trade marks at The National Archives website. This entry was posted on December 8, 2016 by Lynn Rosack in Antique Trivets & Stands, Great Britain and tagged British Rd Diamond, cast iron, firebar trivet, United Kingdom.